The project hosted a number of events between 2015 and 2018, listed below. Links are given where video is available. Summer Development Workshop for early career researchers, aimed at building a cohort of interdisciplinary-minded scholars for the next generation of well-being research (Costa Rica, June 2016). View the workshop details here, and the program here. View the original CFA here. The symposium consisted of three talks by emerging philosophy scholars working on well-being. A light lunch will be served prior to the first talk at 11:45am, and refreshments will be available throughout the event. Mid-Point Workshops at SLU that brought funded researchers together to share and discuss their work. The first mid-point workshop was held from June 1 - 3, 2017. The second mid-point workshop will be held from June 21 - 23, 2017. St. Louis Area Well-Being Workshops (SLAWW). Three workshops for St. Louis area well-being researchers, aimed at building relationships and dialogue in the local academic community (2015-2018). The first workshop was held February 26, 2016. The second workshop was held February 24, 2017. The third workshop, on the theme of stress and its measurement, was held February 16, 2018. SLU Lecture Series. A series of lectures at SLU (2015-2018). Videos of the talks can be found here. Capstone Conference that gathered most project participants, from May 22 - 24, 2018 in downtown St. Louis at the beautiful Magnolia Hotel, and included a major public event at the Sheldon Concert Hall the evening of May 23. Conference program here, and videos of the talks can be found here. 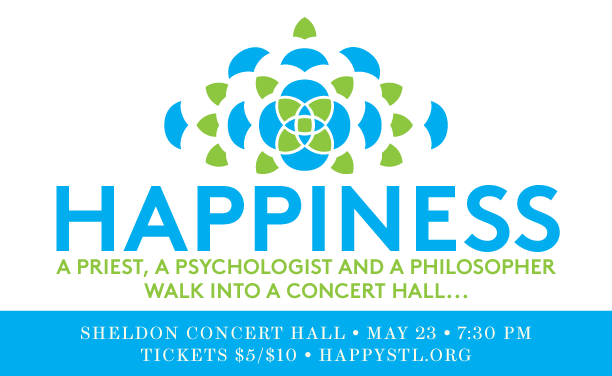 Happiness: A Priest, a Psychologist and a Philosopher Walk into a Concert Hall... A public event held during the Capstone Conference at one of St. Louis' leading performance venues, Sheldon Concert Hall. Information about the event here. Videos of the talks can be found here.